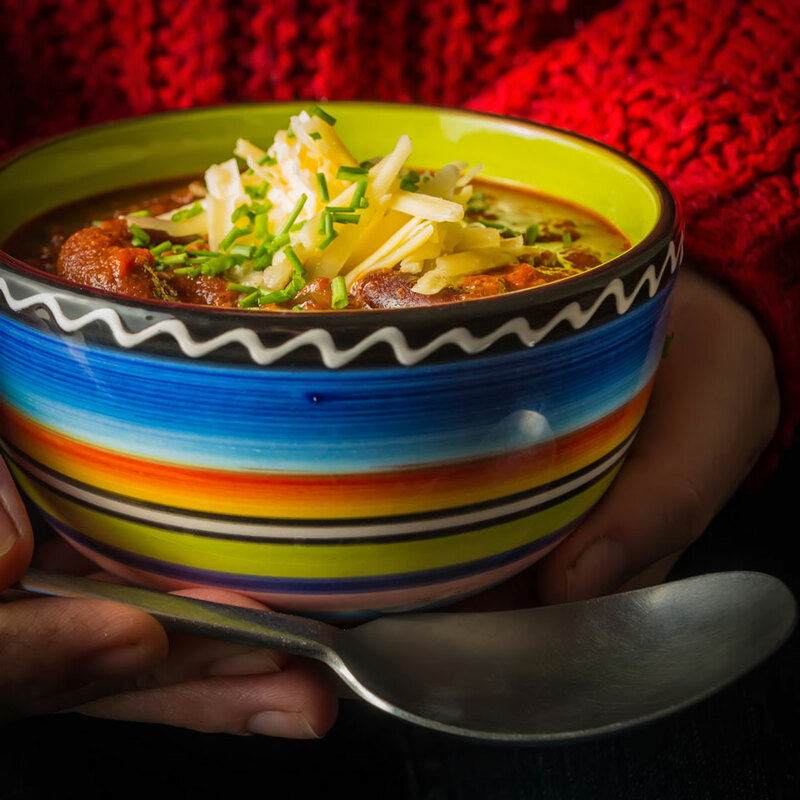 I reckon most cooks have a chili con carne recipe and this is mine given the Instant Pot chili treatment, rich unctuous and spicy! 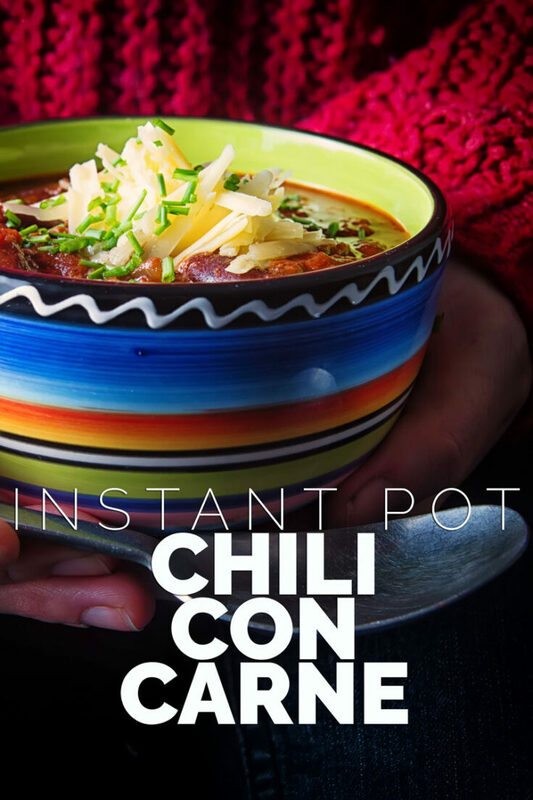 Cliche alert… Much like the scene scene from Full Metal Jacket, I firmly believe that “This is my ‘Instant pot chili recipe’. There are many like it, but this one is mine.”! I do not however view it as either my best friend or my life, more a warm and welcoming friend that just makes things a little bit better. 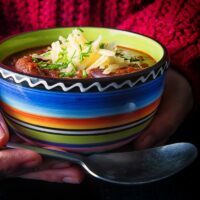 I have kicked around the notion of putting my chili con carne recipe up here on Krumpli for you all to play around with and fought that urge instead offering up my play on a chili in the form of a pumpkin chili. However the arrival of my InstantPot has persuaded me to dust of my recipe and update it a little and create my own Instant Pot chili recipe. Like most of my Instant Pot recipes I have adapted from my old staples very little has changed apart from obviously cooking times, the big difference is always liquid levels. I usually cook my chili in a ‘dutch oven’ with a slightly cracked lid allowing some liquid to evaporate. 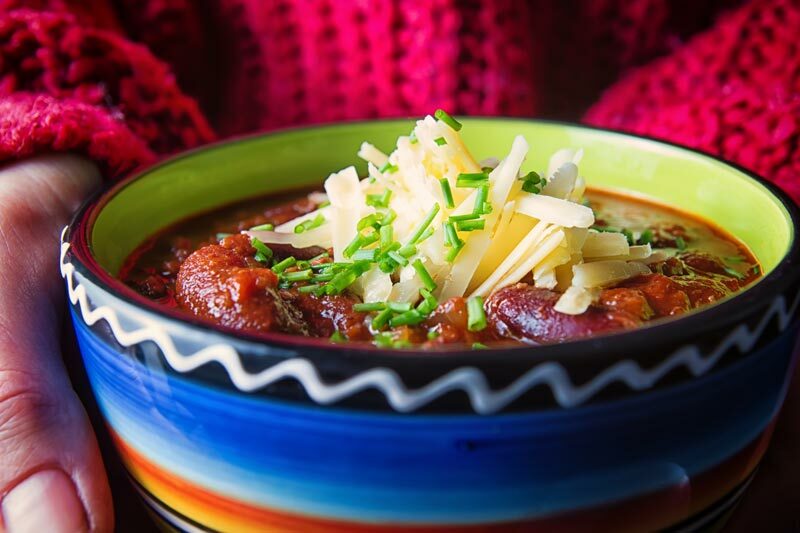 But because that does not happen in a pressure cooker the initial liquid levels for this Instant Pot chili have been scaled back a great deal. The other possibly unusual addition is the butter and paprika at the end, my time in Hungary has taught me that paprika really does not to be cooked too hard. All that is needed in order to get the best of it then some gentle heat. As for butter, well it’s butter and butter adds a glorious roundness and beauty to everything, the French have used butter to enrich sauces for like a million years, so it can only do good things to a chili! I can’t believe that this time next week we will be in March and I will be in a state of panic to get myself ahead both here and elsewhere ready for our first visitor of the year, my Mother in Law is making her first visit much earlier than normal this year to see a different side of Hungary. We will naturally be all about culture, well primarily booze and sport, both of which she enjoys so we have a week of Football, Handball and Water Polo scheduled in along with the consumption of obscene amounts of alcohol. No doubt there will also be lots of eating out in overly generous Hungarian restaurants. And then… Well then it will be time to plant our crops once again and begin our annual dance with Mother Nature, note I refer to it as a dance now. By the time we get to August it will be referred to as a bloody pitched battle. 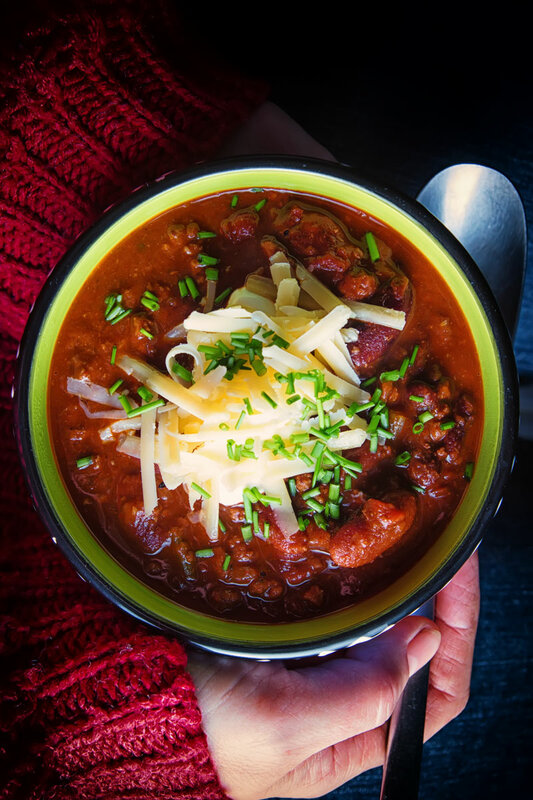 But hey change of seasons YAY, enjoy this Instant Pot chili and keep your eyes open over the next month for some new season food. 200 g Onion, Cut into a medium Dice. 50 g Celery, Cut into the same size as the onion. Begin by mixing together the beef stock, tomato puree and Worcestershire sauce and set aside. Set the InstantPot to Saute and when hot add the cooking oil and when hot throw in the onion, carrot and celery and soften for 10 minutes stirring occasionally. Meanwhile heat a separate frying pan over a high heat and brown the minced beef, you can of course do this in the InstantPot if you wish, for me a frying pan is better at this. As the beef is being browned, remove any fat and liquid and add to the beef stock mixture. When the beef is browned set aside. By now the vegetables should be softened and cooked for 10 minutes so now add in the garlic and stir for 30 seconds before adding in the beef and stirring. Then add in all the herbs and spices and stir to combine. Now turn off the saute mode and return to the frying pan in which you fried the beef, add it to a high heat and de-glaze the pan with the beef stock mixture scraping the bottom of the pan. Add this stock mix to the InstantPot along with the beans and stir. Finally add the tomatoes to the top of the mix, do not stir and attache the lid and cook for 10 minutes on manual high pressure with a 10 minute natural release. When you remove the lid stir in the paprika, butter and molasses until combined and allow to sit for 5 minutes before serving. Serve with sour cream, grated sharp Cheddar cheese and maybe some snipped chives. Tried this last night and it’s absolutely lovely! So earthy, rich and full of flavours. Perfect comfort food now that we’re heading towards the fall. Lovely! Chilli is such a great and reliable dish. It is great to get it tweeked to your own recipe. Looks and sounds totally delicious, perfect supper dish. That is a big bowl of deliciousness! 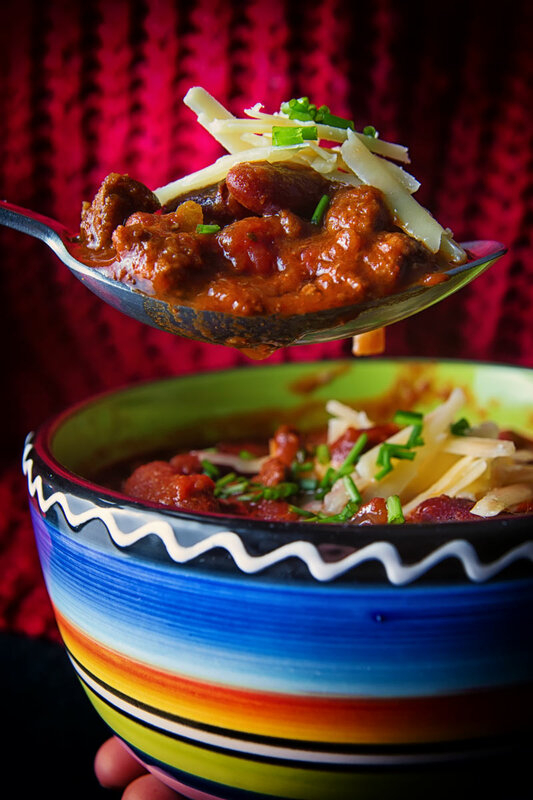 I love chilli – it’s such a comforting dish on a cold night. Most definitely an all time favourite! Wow what a vibrant bowl of food. Ive heard a lot about instant pot and all v positive. Cheers Emma… The IP is pretty impressive, there are a couple of areas where it is not 100% but for what I use it for it is awesome! 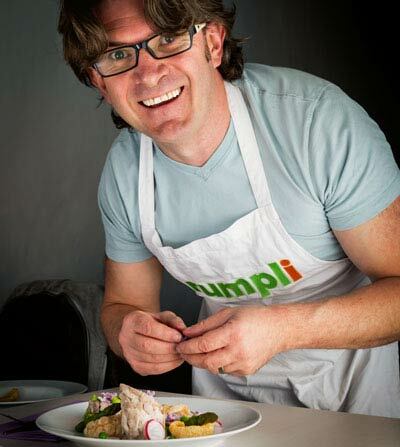 The flavours in this recipe look great, I might try it without the meat as I am vegetarian. Looks like a bowl of delicious comfort food. Hope your Mother-in law enjoys it if you make it for her.